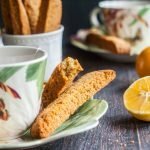 These Paleo Meyer lemon ginger biscotti are so easy to make and are gluten free. Fresh, Meyer lemon and spicy ginger are perfectly balanced with a hint of honey sweetness. In a large bowl add egg and beat. Add honey, butter, ginger and zest and mix well. in a separate bowl, mix the almond flour, coconut flour, salt and baking powder. Add dry mixture to the wet mixture. Line a cookie sheet with a piece of parchment paper or silicone mat. Shape the the mixture into a flat rounded rectangle. Bake for 22 minutes or until golden brown. Take out of the oven and let cool for 30 minutes. Using a sharp knife cut into 8 pieces buy pushing straight down and not in a sawing back and forth motion. Turn pieces on the their side and bake for 10 minutes. Flip and bake another 10 minutes. Turn off the oven and let sit in the oven until they are completely cool, about an hour or two. Store in a sealed container.